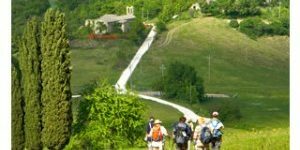 The Cammino di Francesco or Way of St Francis in Italy takes pilgrims on a journey across the land St Francis of Assisi walked in his travels, stopping in many locations associated with the saint’s life as well as his teachings. One of the most important Franciscan sites along the route is La Verna Sanctuary, and it is here where the marked St Francis Way officially starts (from Florence you will be following red-white markings). This 13th century church was built after the apparition of the Virgin to St Francis and houses several relics of the saint; of special interest to pilgrims is the habit worn by St Francis when the stigmata occurred, two years before he died. The Quadrante is the main paved square in La Verna, surrounded by a stone wall enjoying magnificent views of the valley of Casentino. From the Quadrante square you will reach Basilica Maggiore, dedicated to the Virgin Mary, consecrated in 1568; where you will find the most important works by 15th century sculptor Andrea della Robbia. The corridor is lined with 18 frescoes, depicting different chapters in the life of St Francis. The chapel is built on the site of St Francis stigmata episode. The friars from the monastery walk in procession from the Church of Santa Maria to the Chapel of the Stigmata twice a day. La Verna Forest is a natural haven, home to an extraordinary wealth of flora and fauna; with wildlife including deer, wild boar, wolves, as well as owls and peregrine falcons. The forest is kept by Franciscan friars. According to legend, St Francis after receiving the stigmata left the Sanctuary of La Verna in September 30, 1224 to return to Assisi. At the Casella, he stopped to admire the landscape for the last time and looking towards the Mount of La Verna said farewell with deep emotion: “Addio, monte di Dio, monte santo, mons coagulatus, mons pinguis, mons in quo beneplacitum est Deo habitare!” He then planted a wooden cross. After his death, the community of Caprese erected a chapel where small miracles have been reported. A chapel was also built later on and several monks lived there. Caprese is also the birth place of Renaissance master Michelangelo. The village was named Caprese until 1913 when the inhabitants decided to add the name of Michelangelo, to honour their most famous and talented son. 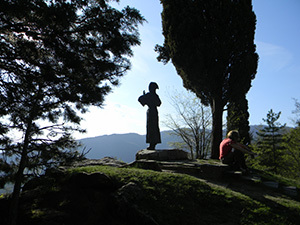 Each year on 17th September, pilgrims from parishes around the region travel to La Verna to honour St Francis. 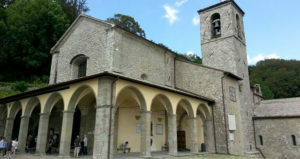 La Verna is located on the first section of the St Francis Way from Florence to Sansepolcro. Please note the Way of St Francis is a stunning trail but we have marked it as a level 4 in terms of difficulty, and therefore only recommended for experienced hikers and walkers. In addition, it is worth noting this is an off the beaten track trail so you won’t encounter many fellow walkers. 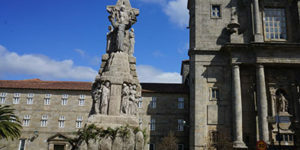 For more information about the St Francis Way or to book your trip, contact our travel specialists. 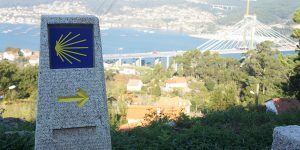 Camino de Santiago or Camino to Rome?